A clinical study shows that a drug therapy involving Tolvaptan resulted in a 50% reduction in cyst growth for patients with Autosomal Dominant Polycystic Kidney Disease (ADPKD). Polycystic Kidney Disease or PKD is a hereditary kidney disease that causes the kidneys to be filled up with cysts. 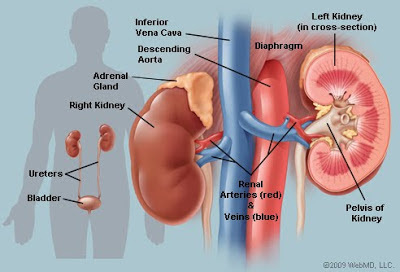 Over time, the kidneys get larger and larger. This generally results in kidney failure. People with PKD experience kidney pain, bleeding, infections and high blood pressure. It also may cause the appearance of cysts in the liver and the weakening of blood vessels in the brain which can result in an aneurysm. There is no specific treatment for PKD, at the moment all therapies are just supportive therapies. These therapies target pain management, infections such as UTI, monitoring kidney functions and blood pressure levels. In the case that the kidney functions declines or deteriorates, kidney dialysis or a kidney transplant is required. There are two types of PKD, Autosomal Dominant Polycystic Kidney Disease (ADPKD) and Autosomal Recessive Polycystic Kidney Disease (ARPKD). ADPKD is hereditary and is caused by a PKD gene mutation. If one parent carries the gene, there is a 50% chance of their child developing the disorder. ADPKD is the most common of the two affecting about 1 in 1000 people. With ARPKD, one of the two PKD genes of each parents is defective and is recessive, meaning that the parents do not have PKD. There is a 25% chance that the child will inherit both defective PKD genes. ARPKD is more serious since the disease manifests itself from childhood and can cause serious lung and liver disease, end-stage kidney disease faster than ADPKD. ARPKDt usually causes death in infancy or childhood. A drug therapy shows promise for treating ADPKD, Mayo Clinic researchers say. The medication, tolvaptan, slowed the pace of kidney cyst growth over the three years of the study. The phase three clinical trial results were being presented today at the American Society of Nephrology annual meeting and published online in the New England Journal of Medicine. The multicenter study found tolvaptan demonstrated a nearly 50 percent reduction in the rate of increase in total kidney volume (a measurement of kidney cyst growth) in ADPKD patients over the study period, compared to placebo. "ADPKD is the most common inherited and the fourth most common overall cause of kidney failure worldwide," says lead author Vicente Torres, M.D., Ph.D., Mayo Clinic nephrologist. "In most patients with this disease, relentless cyst growth within the kidneys destroys the tissue, causes hypertension and painful complications, and negatively impacts the quality of life," Dr. Torres says. "The results of this study reveal a potential treatment that blunts kidney growth, lessens associated symptoms and slows kidney function decline when given over three years." While the trial findings are encouraging, tolvaptan has not yet been approved for this indication, Dr. Torres notes.